The seventh minute saw the opening try for St Pats when Harry Warburton collected a high ball to walk over the line unopposed to score. The kick went in front of the posts into a strong wind, the side in black and whitre hoops were 4-0 ahead. The second try came on twelve minutes when Andy Higham was one of a crowd of St Pats players who could have walked over to complete a fifty metre passing move. Once again the conversion was missed, the wind wreaking havoc but the Police were unable to make much headway with the advantage of it. On sixteen Curtis Hampson went under the Police tacklers to punish an earlier penalty for a high tackle. 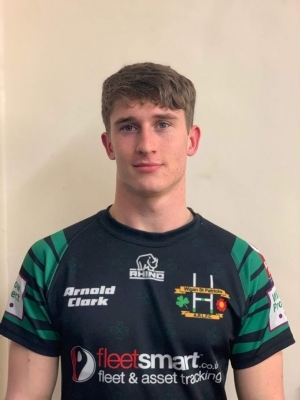 This time Harry Warburton was able to add the conversion, Wigan St Patricks now 14-0 up, the early signs looked ominous for the Police. The Police were awarded a penalty for offside on twenty-eight and on the fourth tackle Sam Odgen-Lawson went from acting half-back to score. Jack Snowden was unable to add the extras, the visitors trailing 14-4. A fantastic solo try from forty metres from Dan Scanlon saw the winger dance his way down the left wing to shrug through three tackles to cross the line. Snowden converted brilliantly from the touchline for 10-14, a superb last twenty from the Police had got them right back into the game at the break. The first action of the second half saw Josh Tate sin-binned for a professional foul on forty-three. But the twelve men drew level when Aaron Lloyd threw the dummy before going through the gap he’d created to ground. Snowden was unable to add the conversion, the sides all square at 14-14. Chris Smith found a gap after St Pats spilled the ball on their twenty. Still a man down the Police had now scored four unanswered tries, the Wigan heads were going, Snowden added the extras for 20-14, a tremendous fightback. On fifty-seven the St Pats fightback bore fruit when Richi Allan found his way to the line. Hampson took over the kicking duties, slotting the ball between the uprights for 20-20. St Pats shunned a simple two on sixty-three then spilled the ball on the second tackle and the Police did the same three minutes later, this time making a forward pass on the fourth tackle. The Wigan side were back in front thanks to a Warburton sprint down the left wing off a Brown pass to improve the angle slightly for Hampson, but he failed to add the extras, the home side with a 24-20 lead with just under ten minutes left. Warburton completed his hat-trick, again flying in down the left wing, to seal the Wigan St Patricks win. It was an awful attempt at a conversion but at 28-20 with a couple of minutes left, it was all over. This was another fantastic Coral Challenge Cup game from the world of amateur rugby league. Early St Pats dominance evaporated and the part-time amateur side from GB Police did brilliantly against their more illustrious opposition to take the lead when a man down. In the end there was a slight fitness edge for the home side and it is they who will be in the hat for tomorrow night’s third round draw. Wigan St Patricks: Horrocks, Sproat, Arrowsmith, McGaughey, Warburton (3T, G), Hampson (T), Prior, Allan (T), Higham J, Brandoch, Jones, Higham A (T), Brown. Subs: Rosser, Malkin, Blake, McLaughlin. GB Police: Snowden (2G), Webber, Tate (SB on 43), Noi, Scanlon (T), Smith (T), Lloyd (T), Southwell, McCloud, Froggatt, Sampson, Motum, Marsden. Subs: Greaves, Ogden-Lawson (T), Wildman, Gallagher.